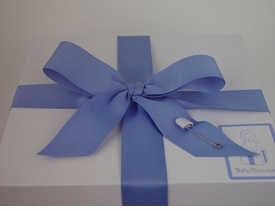 To make your gift shopping easier, BabyBox.com offers specialized gift services. Our Baby Gift Registry makes it easier to receive just to gifts you want. Our signature gift wrap makes each gift arrive looking perfect. Our Baby Shower Games section is filled with some of the most popular games to make your shower a success. Our Baby Shower Recipes will provide you with delicious and elegant food for your special day.